In the heart of downtown Chicago lives the visual history of how our world came to be. 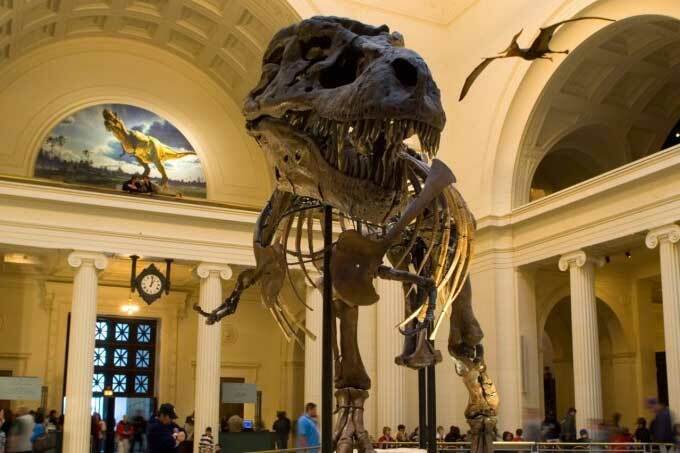 From mummies and dinosaurs to a DNA discovery center and an exhibit on conservation, the Field Museum is one of the largest natural history museums in the world. 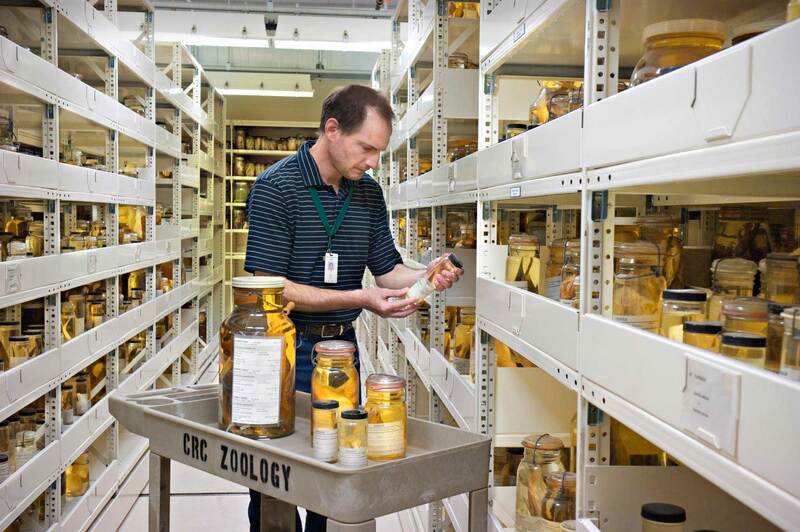 With over 24 million specimens in its collection, and a growth rate of 200,000 items per year, the museum is no stranger to the specific needs of museum storage. 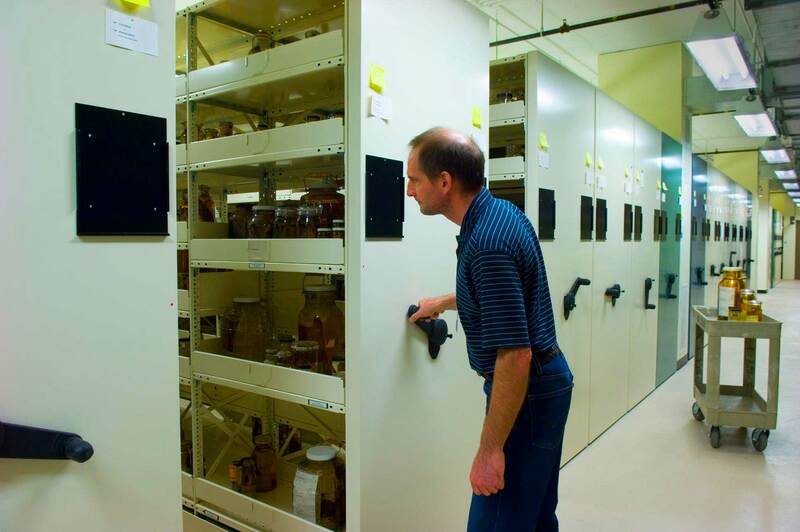 Due to the rapid flux of artifacts, the Museum recognized a larger problem than simply having the right kind of storage — they didn’t have enough storage. 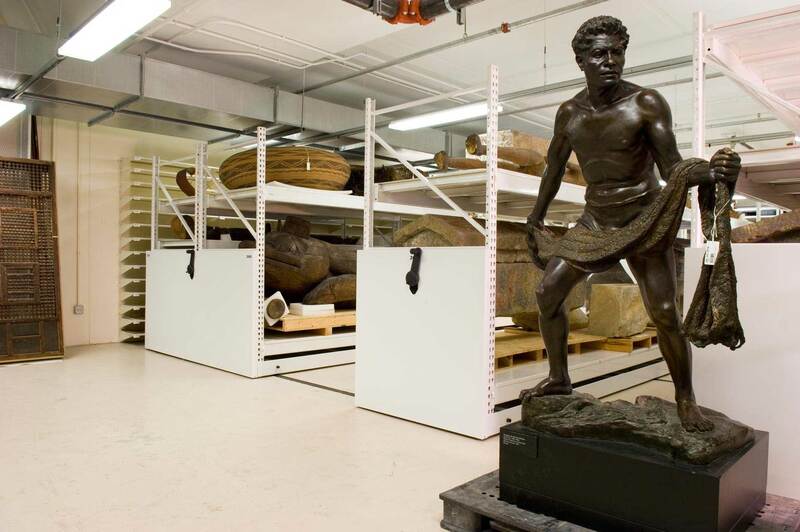 The museum was quickly outgrowing its collections storage space—the delicacy of the collections necessitated specific storage, but in the current facility, it simply couldn’t happen. 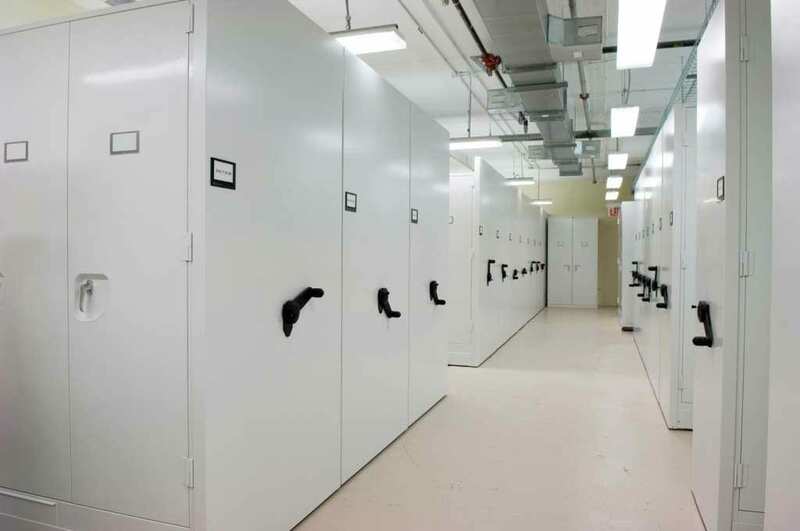 A new facility is what they needed, and several years later, the Museum’s Collection Resource Center (CRC) gave them the opportunity to design the ideal storage for specific collections. 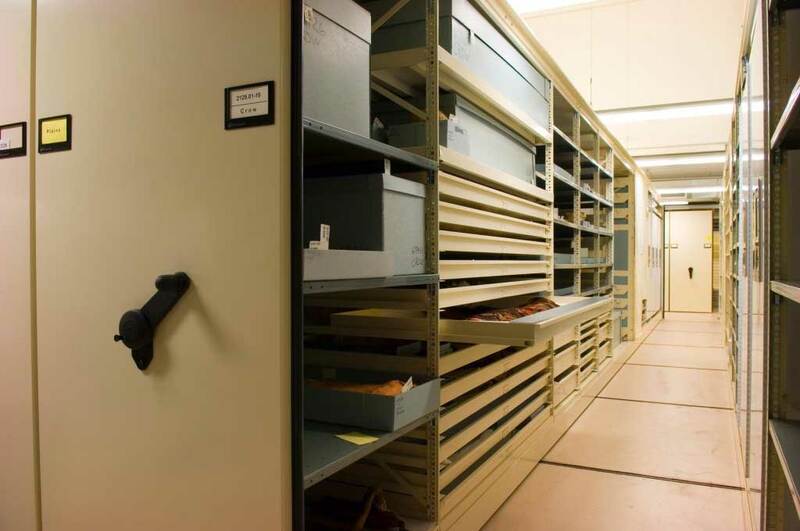 In addition to museum collections storage, the facility was also going to double as an elaborate research facility for a worldwide network on visiting scientists. 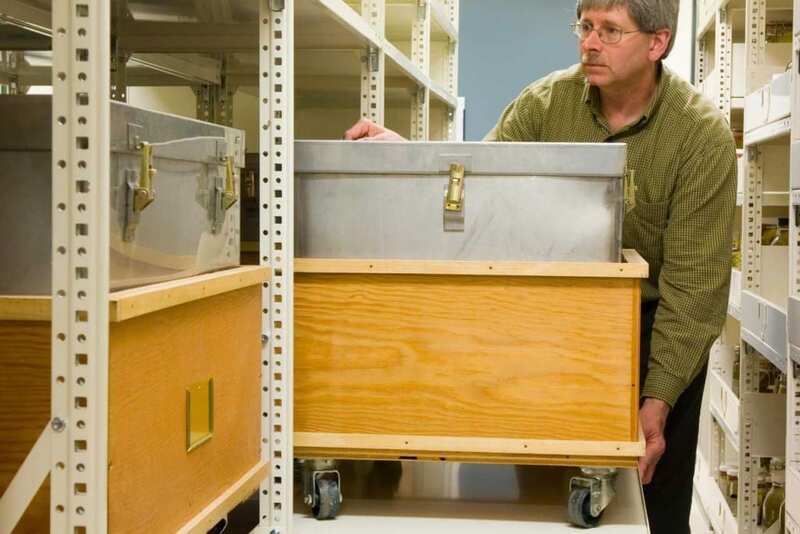 The two-level, 180,000 square foot building needed to protect collections while allowing accessibility to these scientists—so any storage systems created had to offer utmost protection with easy accessibility. Even with the increase in square footage, the CRC needed a compact storage solution that would allow for safe storage and for future growth of collections inventory. 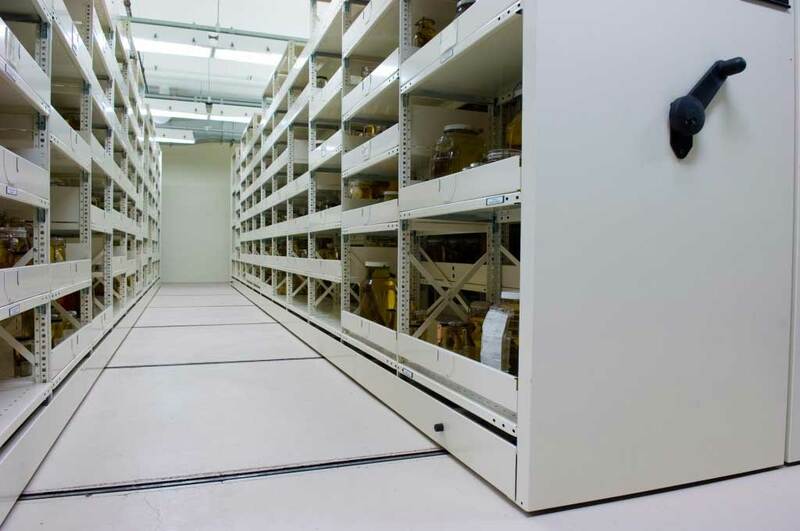 In surveying the types of collections, we realized that we could design several compact mobile storage systems to utilize a variety of shelving and museum cabinet options for each of the collections. Accommodating evolving collections and future growth. Below illustrates how those goals were realized over a few specific areas. 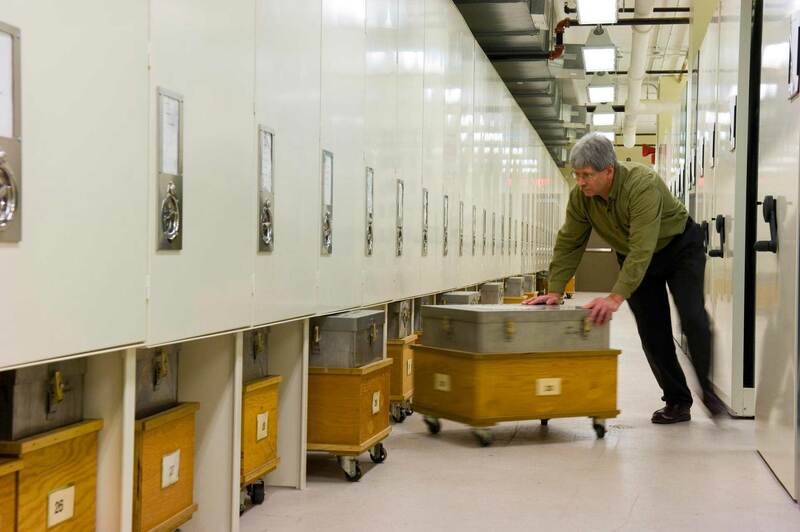 The Field Museum’s Anthropology storage area is home to thousands of objects—and no two seem to be the same. To account for the wide variety in the artifact’s shapes and sizes, 111 mobile carriages were outfitted with a mixture of shelving, pullout racks and trays and racks for rolled textiles. These carriages range from eight to 10 feet in height and 36 to 48 feet in length. A separate mobile system with a weight capacity of 12,500 pounds was also installed for heavier items, which featured offset carriage controls for ease of forklift access. 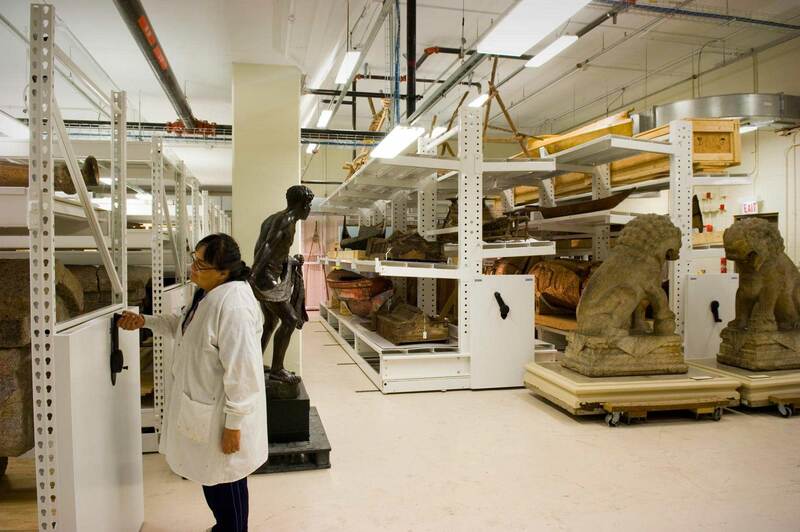 Other systems were outfitted with cantilever shelving, which permitted museum staff to configure the shelving on their own based on the artifacts that were in storage at the time. The compact storage systems in this area feature unique design features, like a specially-built precautionary rain gutter system at the top of the units to route potential water leakage from the ceiling onto the floor and away from stored objects. 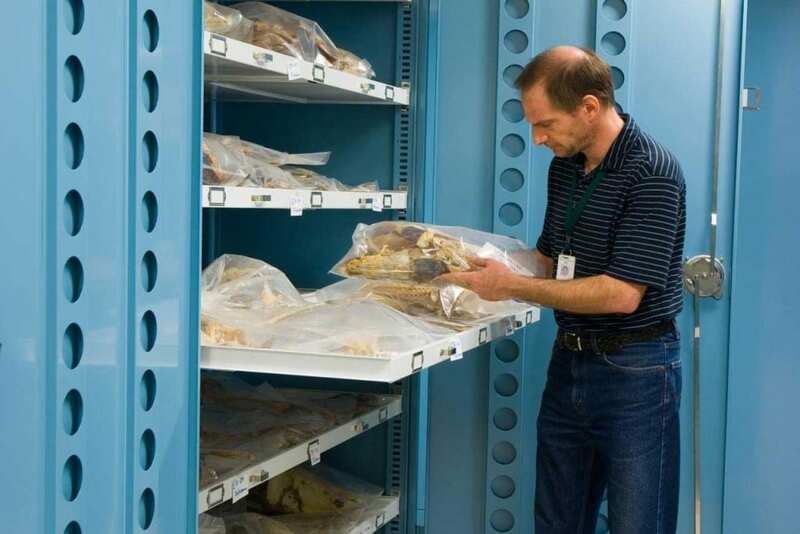 A portion of the anthropology area is used to display collections for private tours. The displays are interspersed among office-grade fixed cabinetry and shelving of various widths, heights and load capacities. In this area, small and medium-sized fossils sit on high-density mobile systems outfitted with cabinets, while the large fossils are safely stored on heavy-duty, wide-span, mobile shelving systems to accommodate pallets of fossils. 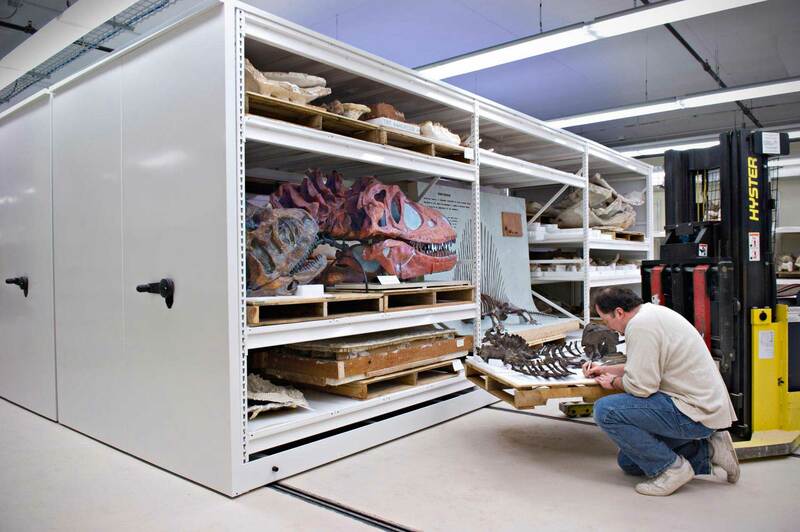 Scientists can access the fossils using narrow-aisle forklifts, and they often get transported to nearby worktables for elaborate study. The compact mobile storage used for wet collections within the Zoology area are outfitted with adjustable pull out drawers for ease in locating a particular specimen by sight. Specimens in glass jars that sit on these drawers have been designed with front “earthquake bars” with label holders to prevent the jars from falling off. Custom-built side panels within the shelves separate specimen groups, and backsplash panels are also used where needed. 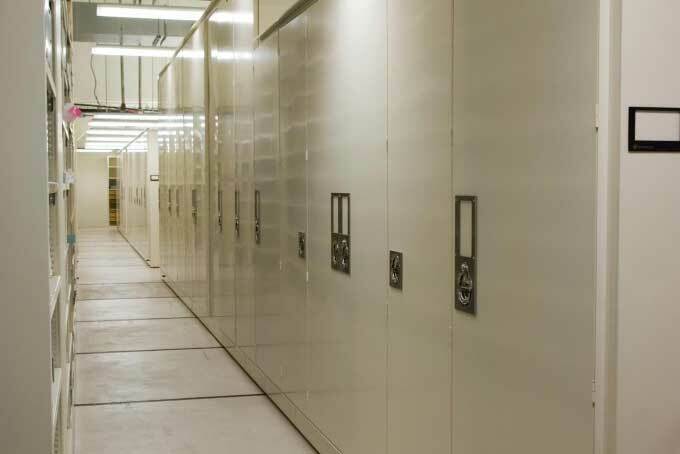 The high-density mobile storage units in particular feature a host of enhancements designed specifically to protect collections. These include synchronous drive carriage systems to guard against vibration without compromising efficient use; customized drives that provide balanced movement even under unbalanced loads, reduced gear ratios for controlled movement, recessed anti-tip rails to provide extra stability for the carriages, and powder-coat finishes that won’t flake. 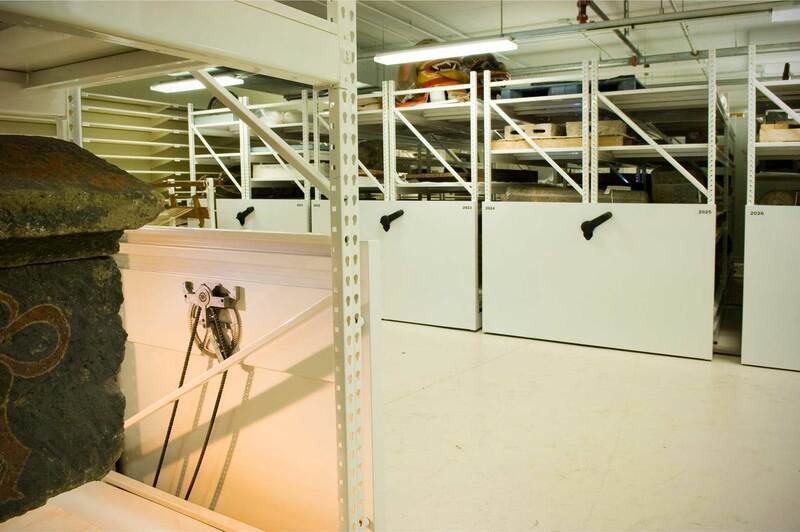 Additionally, the systems in the wet collections feature leak detection sensors within the rails, and hinged doors were installed on several of the mobile systems to help minimize exposure to light, dust, and other particles that could potentially damage collections. 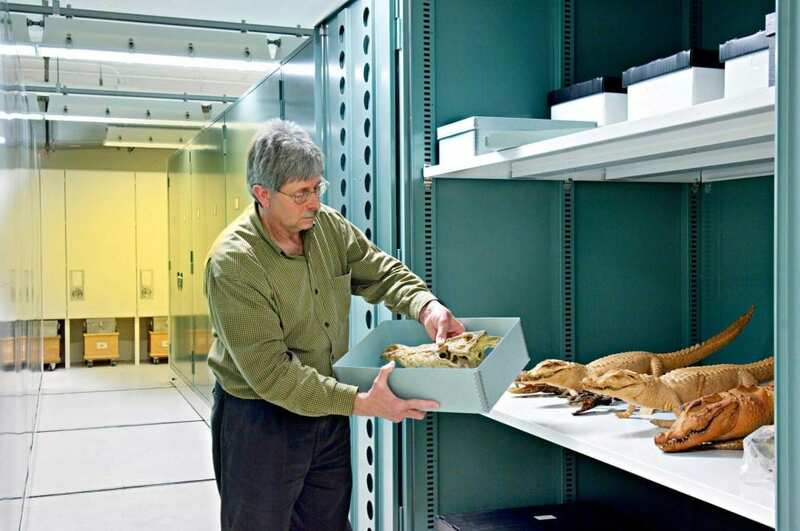 In the end, customized solutions meet the museum’s highly complex museum collections storage needs—allowing The Field Museum to chart new territory with a state-of-the-art facility that sets the standard in museum collections and research. In museums, not every storage challenge is created equal.